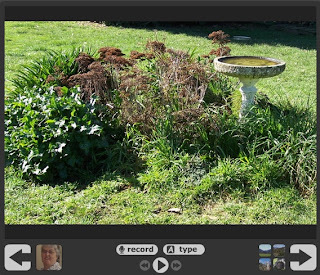 VoiceThread is a great tool for collaborative learning where you can record a voice-over to your photos and invite audio comments. I have made this pdf that you can download that will take through all the steps to making a Voicethread. Click here to get it. Here is the basic outline of what is in the pdf. Firstly you do the registering thing that you are by now very used to. Click on CREATE and add a title and description for your VoiceThread. Upload the images that you want to use. This may take a little time at high resolution but be patient. When the uploading is finished you will see an organiser. You can change the order that you want the photos to play by dragging them to where you want them to be. Once your order is sorted record your voice-over or type your message. You can re-record your message if you muck it up. Once happy with your sound byte click save and move on to the next photo. 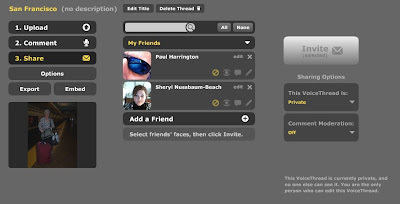 Add some new commenters by adding a name and a photo. When a new person wants to add a comment click on SWITCH (top right hand corner). Annd add a new avatar and name. Now you have switched identities to the one who wants to add comment they can record their comment and it will play after your initial sound byte. For the purposes of this practice I have pretended to be my student Jane! For the security conscious you can of course turn on comment moderation in the options pane and the world (or other children) will not be able to hear the comments unless you approve them. Be sure to change your Voicethread to public if you want others to be able to see and hear your VoiceThread. 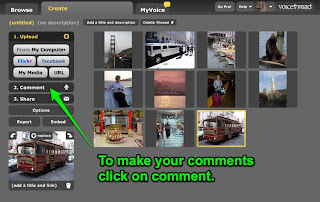 When you are happy click on Share and decide your sharing options- you need to make your Voicethread public, turn on comment moderation and you may like to let it be added to the Browser if you are OK for random others to enjoy your Voicethread. 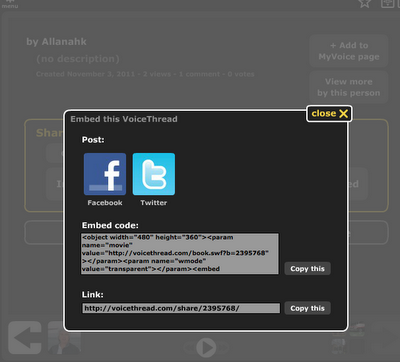 To put your Voicethread in the public arena click on Embed to embed or link from your blog or wiki. Decide what options you want. Clicking on the code selects it- then you can copy it and insert it into your blog. You can change the width and height for your space to fit your Blogger template if you want but be careful to keep the aspect ratio right otherwise your VoiceThread will look lopsided. For this blog post I changed the size to 600x600. For a Voicethread on how this works click here. I can see lots of possibilities for this tool. If you can think of some or link to some ways you have used it please leave a comment. You can also construct Voicethreads via your iPad. To get the app click on the link below. Thanks for this Allanah. I will play with it when I get a free hour!!! How do you rate it? Would you use it to make podcasts? My Mac schools use Garageband, but I'm still struggling to find something easy for the PC schools. Any suggestions? p.s. thanks for your wonderful tips and blogs - I follow them eagerly. The thing with a podcast that I like is that new episodes find you through RSS and iTunes. With VoiceThread the viewer/listener has to go to the show to watch/listen to it. The thing I really like about Voicethread is that the audience can participate and add to the audio. And of course it is cross platform which should please the PC users out there. There is always Audacity to record audio for PCs but tricky (for me anyway) to add graphics. I teach 8-9 year olds and we are learners who want illustrations to help us so we only ever make enhanced podcasts with photos or drawings. Thanks for posting a how to for using VoiceThread. this is going in my delicious file. Great stuff Allanah. I introduced my students to Voice thread today and this is just what I need for those who are still not sure what to do. This a geat service to me. I am a superintendent of 7 schools in Massachusetts on Cape Cod - Falmouth. 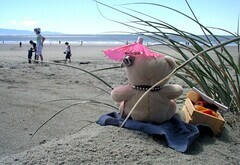 I am new to web 2.0, facinated by it's pedagogical possibuilies and trying to learn what I can. The people I am meeting are the best. I follow you on twitter (dennisar). That's how I heard about this post when I woke this morning - Friday, 19.19.07, 5:33 P.M. now. Now that you've taught me, I'll pass it onto teachers I know. I also enjoyed learning about where you live. Great audio story for someone who has never been to your country. Thanks for your how to guide. Sometimes they are just what I need. Question though....how long should it take upload a photo? I can't seem to get any uploaded. I may just being rather impatient but I have left it going for a while...any advice??? I remember when that happened once while I was at school so I gave up and went home and did the uploading. As I recall I uploaded them through Flickr instead because I was getting nowhere. Have you got the lastest Flash player? Have you downsized the photos so they are web sized not original sized? Voicethread might be too busy- try at a different time??????? Thank you for the this tutorial. 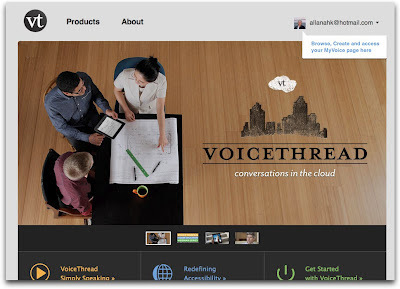 voice thread will add engagement to the readers of your blog. I will try this one.